Columbia Release High-Intensity First TV Spot for 'GHOST RIDER: SPIRIT OF VENGEANCE'! 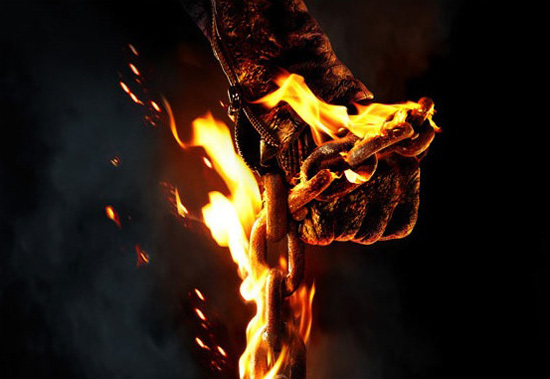 Columbia Pictures have released the first TV spot for Mark Neveldine & Brian Taylor's Ghost Rider: Spirit of Vengeance. The movie opens in 3D & 2D theaters on February 17th & stars Nicolas Cage, Fergus Riordan, Ciaran Hinds, Violante Placido, Idris Elba & Johnny Whitworth. In the new movie, Johnny [Cage] still struggling with his curse as the devil's bounty hunter is hiding out in a remote part of Eastern Europe when he is recruited by a secret sect of the church to save a young boy [Fergus Riordan] from the devil [Hinds]. At first, Johnny is reluctant to embrace the power of the Ghost Rider, but it is the only way to protect the boy & possibly rid himself of his curse forever. Hit the jump to check it out. I'm reading: Columbia Release High-Intensity First TV Spot for 'GHOST RIDER: SPIRIT OF VENGEANCE'!Tweet this!